The Relief Teacher: I'm back! Oh my! I can't believe how long it's been since my last entry, this year has just been chaos! However, now that it's the school holidays, no more excuses, it's time to get writing again! 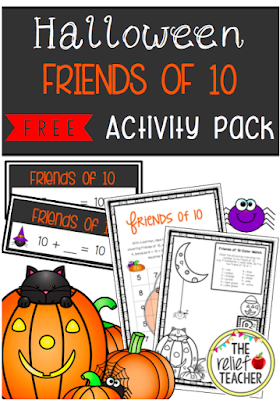 Halloween *Friends of 10* activity pack! Since my last post in February (eek!) I've been busy both in the classroom and in store. As always, it's a challenge changing classrooms and schools from week to week, but now that it's the holidays, it's time to restock and reflect. What I've always loved about the teaching profession (a part from the students) are the loving and kind teachers that I work with everyday. Not only do they keep me sane on those difficult days, they also inspire me with their endless dedication and generosity for the whole school community. For this reason, I want to redouble (more like quadruple) my efforts to write about and share my teaching experiences as a relief teacher, so that I too can give back to the teaching community. This post will be one of many this month - so get ready! I'm pumped to truly and properly begin this blogging journey, and hope you are too!